Monday Dose of Market: Finally, I am a Farmer! Lots of things made me smile at the Denver Indoor Farmers Market this weekend. First were the tomatoes. I’ve said goodbye to tomatoes several times over the last few weeks, thinking I’d seen my last fresh local tomato until next summer. 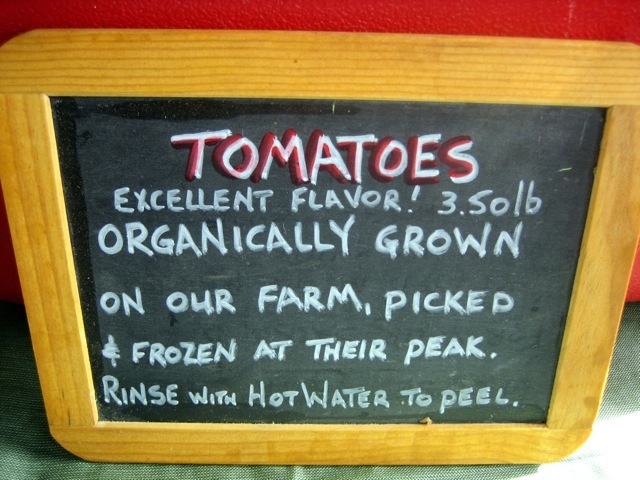 I never considered frozen tomatoes. Berry Patch Farms picks ‘em when their the ripest and pops ‘em in the freezer. Brilliant. The second thing that made me smile was learning that Andy from Twin Mountain Milkhouse  brought me a gallon of raw milk to the market. After mulling over whether to offer cow shares to folks in Denver, he decided to give it a go. And I’m the first Denver member, woo hoo! After filling out my cow share paperwork, Andy shook my hand and said, “you’re a farmer now!”  Later that night while telling some friends that I own part of a cow, two of them asked in unison, “which part?”  Good question. The third smile getter was ‘Omelet.’  I got to pet her. Read more at The Weekly Veggie. Thanks for visiting!